Talk about a book fog. Ever since I saw the cover for Swear on this Life I was intrigued. After my mad love for Before We Were Strangers part of me was nervous though. I mean that book was my #1 book for 2015, so that’s mighty big shoes to fill. But let me tell you, Renee totally nailed it. I woke up early on a Saturday morning, and never left the bed until I finished the book. I never stopped. I was pulled in and there was no stopping me. There are so many things one can take away from the books they read. For me, this book makes me think of regret. Emiline had a very rough beginning in life, and to be honest, I fell like she’s been living in a fog for the past few years. Going through the motions, even though she doesn’t think so. When she discovers that J.Colby is none other than her best friend/boyfriend, from when she was younger, and that he has basically written about her life, she is completely blown away. 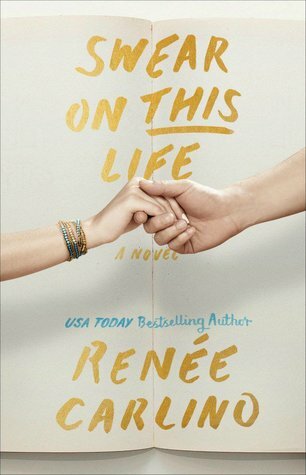 While this book is technically fiction, there’s too much real life to just let it go. As she reads it, slowly, she starts to relive a past in which she has so desperately tried to forget. When she comes face to face with Jase, all those feelings come fully out. She decides to take a good hard look at her life and decides what she wants out of it. She makes decisions that I don’t believe she could’ve made without this book’s nudging. Em and Jase’s lives were nothing like the fairy tales you wish for. They were raw and gritty and very real. They learned to rely on each other for their sanity basically. I think after reading Jase’s book, Em starts to realize that there’s more to her than she realized. My heart was racing and quite a few places in this book. I mean legit racing. I wanted a HEA. I needed a HEA. But not everything in life is happy, so I had to hold on tight and hope. If you like second chance romances, with a hefty dose of angst and emotion, then be sure and grab this book. You can thank me later.